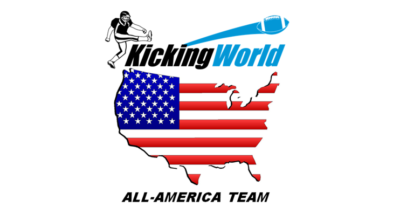 The 2018 Kicking World Invite-Only National Showcase brought 61 of the country’s best prep kickers & punters from over 20 states to Austin, Texas on December 8-9. Kicking World’s top specialists were hand-picked by Coach Brent and the staff throughout the 2018 camp season. Of those over 1,200 camp attendees, only 73 were invited to this prestigious event. National Showcase participants competed throughout the weekend to showcase their talent and gain the attention of college football coaches from around the nation. Several college football coaches streamed the Event live on YouTube, as did hundreds of other families, friends & Kicking World fans. Over the previous 4 years of our invite-only National Showcase, over 25 offers were received within 2 weeks following this event! We expect no different in this 5th installment as already over a dozen schools have shown new interest in 6 of the weekend’s participants. With an average temperature throughout the weekend of just 47 degrees, and overcast/drizzly conditions on Day 1 and a cold breeze on Day 2, the elements certainly came into play at this year’s National Showcase. Both day’s punt portions were most affected – between damp balls, frozen hands, and a crosswind affecting the drop – it proved difficult for even the best punters. Charted Punt numbers do not reflect the true capability of the punt event participants. Campers did however fair exceptionally well on both kickoffs and field goals. We used brand new out of the wrapper Under Armour 695XT footballs throughout the entirety of Day 2, with each ball precisely inflated to 11.5 PSI. On Day 1 because of the low 40 degree temps, wet field, and light rain, we cycled through an assortment of used leather balls, with none being overly worn. Classroom presentations included tips on creating and following a kicking blueprint, college recruiting strategy, and mental training from a certified Sports Psychologist. ‘Overall’ Competition winners from the weekend – Jared Zirkel (KO), Christian Roig (FG), Cayden Camper (P). CONGRATS TO OUR NEWEST HOT PROSPECTS! Cayden Camper moved up from an OTC Hot Prospect to a full-fledged Kicking World Hot Prospect after an outstanding showing! The camp weekend as a whole showcased a high level of talent all weekend. We’ll expect much more on punts going into the 2019 season, but the kickoff numbers and field goals were impressive. It’s not too often you see high school kickers hitting 60 yard field goals or putting kickoffs through the uprights over 80 yards! Most importantly to us is the attitudes of our campers. We hear it during and after every event, there is something different about Kicking World students. We thank our loyal and committed students for continuing to uphold that X Factor and represent Kicking World to the fullest, from coast to coast. College coaches notice these little things and it helps our students stand out from the crowd when getting recruited. We’re fortunate to be a part of each of our students’ journies and look forward to seeing them become successful not only in football, but more importantly in all aspects of their lives! Next year’s Kicking World Invite-Only National Showcase Event will take place on December 7-8 in Austin, TX again at Dragon Stadium. All Kicking World campers will have the opportunity to qualify for an invitation based on their performance at any 2019 Kicking World Camp.